Discover the potential of Ceylon Cinnamon Bark Oil for 8 important health issues. An exotic fragrance with a spicy hot and sweet taste. This incredible essential oil has some amazing properties. A gift from the Gods. Some people think it is strange to ingest essential oils, but as alternative practitioners’ know, essential oils can deliver powerful benefits. Ceylon Cinnamon Bark Oil sits at the top of this pyramid of some renowned essential oils. Some say it is the elixir of life itself. Ceylon Cinnamon Bark oil is used quite extensively in the food industry, chief among them Coca Cola. There is some evidence that it is the Cinnamaldehyde component of Cinnamon Bark Oil that seems to be effective for blood sugar control. This study found it the most effective compared to berberine (Ber), and metformin (Met) at controlling blood sugar levels. Another study found Cinnamaldehyde from Ceylon Cinnamon Bark Oil (Cinnamomum Zeylanicum) reduced plasma glucose concentration significantly (p<0.05) in a dose-dependent manner (63.29%). In a study from Sri Lanka Ceylon Cinnamon was found to have an effect on blood sugar control in a rat model. In this case Cinnamon was extracted from the cinnamon bark through a water distillation process similar to steam distillation that is usually used to make Bark Oil. Of course there is considerable debate whether Cinnamaldehyde merely masks the symptoms of diabetes by modulating blood sugar control or whether it addresses the insulin production issue which effects blood sugar levels. Considering that most commercial medications do the same thing without promising a cure per se, it is well worth considering Ceylon Cinnamon Bark Oil. Our customers have reported remarkable results in dropping blood sugar levels. It has minimal side effects and well worth exploring. 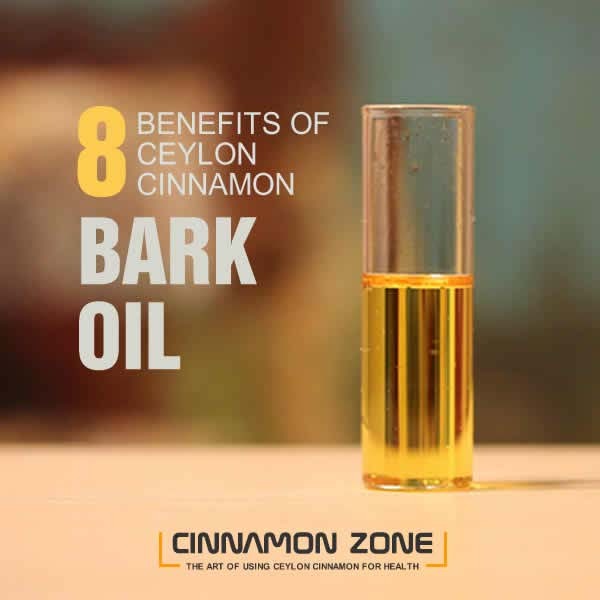 Countless research studies have shown that Ceylon Cinnamon Bark Oil is one of the most powerful antibacterial agents known to man. One of the best known studies was done in France (Study - CHU Hospital Nord, Saint-Etienne, France) where it was demonstrated that Ceylon Cinnamon Bark Oil was effective against 65 strains of anti-biotic resistant bacteria. These include E-coli, Salmonella, Citrobacter, Methicillin-resistant Staphylococcus aureus (MRSA). Many people especially older people suffer from debilitating post surgery complications due to anti-biotic resistance. If you are going for surgery, keeping a bottle of Ceylon Cinnamon Bark oil handy could be a very good insurance policy. Put a drop in your hot beverage. To clean surfaces prone to bacteria dilute to 1% with 99% water and wipe down with a clean micro fiber cloth. Discover how to make your own Cinnamon Oil disinfectant here. This study found that Cinnamon Oil was effective against three strains of Candida, Candida albicans, Candida tropicalis, and Candida krusei. This study discovered that the Bark of Zeylanicum (Ceylon Cinnamon) had an improvement in oral Candidiasis We take a closer look at Cinnamon for Candida here. The latest findings indicate that two compounds found in cinnamon — Cinnamaldehyde and Epicatechin — may be effective in fighting Alzheimer’s. According to a study by Roshni George and Donald Graves in 2013, two scientists at UC Santa Barbara, Cinnamon has been shown to prevent the development of the filamentous “tangles” found in the brain cells that characterize Alzheimer’s. Get an ultrasonic Aroma diffuser, add 1-3 drops of Ceylon Cinnamon Bark Oil and breath it in a few times a week. A few drops added to a hot beverage is another insurance policy. Will it work? Considering the cost and how pleasant the smell of Ceylon Cinnamon Bark Oil is, it is well worth a try. Remember however not to put too much Ceylon Cinnamon Bark oil in the diffuser. It has to be subtle and barely noticeable. Too much and you will get a headache. Same with ingesting. 1-3 drops maximum. You don’t want your blood sugar levels dropping drastically. Cinnamon is well known to improve your mood and reduce irritability. In fact retail stores have been known to pump Cinnamon scents to make people buy. A Time magazine article of 2011 found carefully camouflaged tubes strategically placed amongst the tinsel and glitz piping in a perfect mix of cinnamon and pine. This study by Dr. Bryan Raudenbush, Director of Undergraduate Research and associate professor of psychology at Wheeling Jesuit University in Wheeling, WV. found that the scent of Cinnamon reduced driver irritability. Lost your appetite, feeling bloated and just down right fed up with food? Then a drop of Ceylon Cinnamon Bark Oil will get you going again. It will get rid of the bad bacteria that cause digestive system failures. Stomach gas and bloating will be addressed with minutes. Flatulence gone within an hour. It delays gastric emptying so more of the nutrients can be absorbed into the stomach. Remarkably effective for stomach flu (read here) and helps calm the stomach. The Bark Oil added to a hot beverage or food improves food palatability. This is why our black tea is so remarkably tasty. So convenient for travel. You never know how exotic foods can affect your digestion. If airline food or a contagious passenger happens to give you severe stomach cramps, all you do is fish out your little bottle of Ceylon Cinnamon Bark Oil and pop it in a hot beverage. Given the advent of cruise ship disasters of recent with epidemics of stomach flu, this is a powerful tool to take wherever you go. Dilute it and wipe down any of those terribly dirty hotel rooms. If it can kill most antibiotic resistant bacteria it will kill anything that comes your way. Some parents are beginning to use Cinnamon as a supplementary treatment option for their children with ADHD or ADHD like symptoms. The best known is this study out of Taiwan which used cinnamon oil aromatherapy. Before you take Ceylon Cinnamon Bark Oil make sure you get a high quality steam distilled Ceylon Cinnamon Bark. This should have at least 60% Cinnamaldehyde, which is the magic ingredient that works. There is much fraud with essential oils so be careful what you buy. Talk to the company you buy from and ask questions to get a feel of the company and their reputation. Internally Add 1-3 drops in a hot beverage and drink it. But start with just one drop, because it can drop your blood sugar levels dramatically. Go in stages. Add 1-3% Ceylon Cinnamon Bark Oil in a spray mister bottle and wipe down surface with a clean micro fiber cloth. That means 12 drops per oz. of water at 1% dilution. Diffusion Add 1-3 drops to half cup of water in an Ultrasonic diffuser and diffuse for 3 hours 1-2 times per week. For Massage Mix 1% Ceylon cinnamon Bark Oil with coconut oil or other carrier oil for massage. For example if you use 2 oz's of Coconut oil you would add 12 drops of Ceylon Cinnamon Bark Oil.